Update 2/23/10: For another, all carbon fiber wheel, check out the one we wrote about from Carbon Revolution. A Japanese company by the name of Weds Sport has come up with the first full carbon fiber wheel. 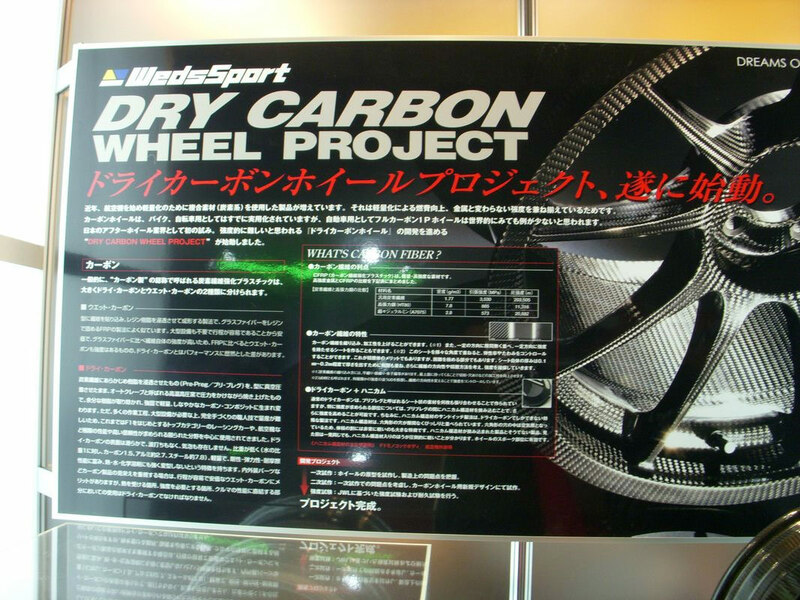 They unveiled the wheels with what they call their Dry Carbon Wheel Project at the last Tokyo Auto Salon (2007) show. One wheel weighs in at just 2.76kg, which works out to be 6.08475844 pounds. Interested in getting a set of these for your car? Expect to pay around $10,000-$12,000 for the set. While it sounds expensive, you can easily spend $8,000+ on custom three-piece forged wheels from a company like HRE. Its kinda of complicated, but it basically says its a Dry Carbon Fiber process that can be used on automobile & motorcycle tires. Something about the weight and color too. It points out the differences between a wet CF process & Dry CF process. Sorry, really not much help after all. I guess your gonna need to get a first gen. Japanese to translate it correctly. If anybody else can translate better, we'd love to know what the rest says...just post a comment below. Weds Sport's display also featured a wheel with a carbon fiber face, but more than likely a forged aluminum wheel surrounding. This is probably a much cheaper solution, and potentially arguably better looks. There is some concern about a wheel being 100% carbon fiber that I've seen from people online...especially considering the weight of the wheel. Is it strong enough to support a car normally driving, let alone at a race track? What about the cost of repairing the wheel if something gets damaged? Does it need to get fully replaced, or can it be fixed for substantially less cost? There is another company by the name of Dymag that makes carbon fiber wheels (which we'll cover in a future post), but their hub is made out of magnesium. Apparently, this is for strength reasons, which makes me think these full carbon fiber rims should only be used for show cars. I'd like to hear Weds Sport's thoughts on this. If you have any insight, feel free to post your comments.